Glastonbury Festival welcomes media interest in our unique event and we try to accommodate coverage wherever possible. However, the Festival does have a media access policy and this extends to photography. If you wish to take photographs at Glastonbury for anything other than private personal use, you will need to have permission. 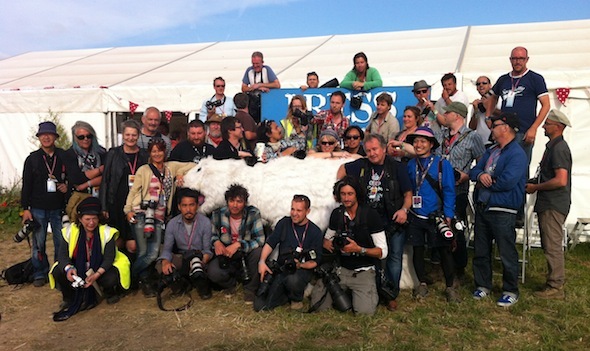 All enquiries about photographic or film coverage of the Festival for news purposes should be made to the Press Office (press@glastonburyfestivals.co.uk). • No trading or other commercial activity by any ticket holder will be allowed on the Glastonbury Festival site without the Festival’s prior written consent. This includes photography or photographic services. Glastonbury Festival will charge a fee for any commercial activity (including filming, photography and recording) on the Festival site if we approve this. • A person may be denied entry to, or removed from the Festival site, if he or she is found in possession of any equipment capable of taking professional photographs, making films, sound recordings or broadcasting (or streaming); or if he or she takes any photograph, makes a film, sound recording or broadcast of anything occurring inside the perimeters of the Glastonbury Festival for commercial gain. • A person may enter the Glastonbury Festival with photographic equipment where it is integrated into electronic communications apparatus designed for personal private use (such as a mobile telephone) and/or a personal stills camera, but the person may still be removed from the Festival site if they attempt to use this device for commercial gain. Please also note that tickets for the Glastonbury Festival cannot be used as part of any marketing, media, sales promotion, staff reward programme or general competition use, whether commercial or non-commercial, without the prior written permission of the Festival organisers. The marks “Glastonbury” and “Glastonbury Festival” and the Glastonbury Festival logo are registered United Kingdom and European Community Trade Marks and may not be used without the express written permission of Glastonbury Festival. Our Press Office can help with all press enquiries. The contact is press@glastonburyfestivals.co.uk. Proposals for commercial photography are only agreed in very exceptional circumstances and are usually limited to our existing sponsors or charitable partners. The Festival also has a proactive ethical policy, which means that we will always be concerned about which companies or organisations are linked to the festival, even if indirectly. Film crews should be kept to a minimum and must have full public and employer’s liability insurance. You must provide us with a copy of your certificate of insurance in advance. Pit photography is at the discretion of each performer. Consent is usually given to photograph the first three songs but this is not automatic. Flying or filming with Unmanned Aerial Vehicles (UAVs, or so-called drones) is not allowed on site before, during or after the Festival – and is prohibited by law. We have a working site and the safety of our audience, crew and staff is paramount. Photographs taken at the Festival cannot be included in any sponsored programme or in any form of advertising without specific approval. Photography is restricted or prohibited in certain areas: family camping areas; children’s areas; welfare and medical areas; security and police compounds; all shared performer compounds. You should only photograph in camping areas with the permission of those you are photographing. You must respect the privacy of everyone at the Festival. These restrictions also apply to performers’ own photographers or film crews. We are sorry this is all a bit ‘formal’ but we receive many enquiries to take photographs or film at the Festival, some of which are wholly unsuitable and/or inappropriate. The bottom line is that if you are a professional photographer, or want to take photographs for commercial gain, you need to get our permission in advance.